Chrome was a big bet when it was introduced six years ago and has since grown to provide a simpler, speedier and safer web for more than 750 million users around the world. Today, Chrome is an integrated hardware and software solution for work that meets the challenges of and innovates upon traditional platforms. Amit Singh, President of Google for Work, who’ll share how Chrome for Work is part of the transformational agenda of many businesses today. He’ll also be announcing a number of new products coming to the Chrome for Work family. Rajen Sheth, Director of Product Management for Chrome for Work, who’ll discuss how devices have revolutionized the way we work. He’ll also uncover a few pathways of our top-secret roadmap and may have a few surprises in store. To be a part of Chrome Live, all you need is a comfortable seat, an Internet connection and a computer, tablet or phone; pants are optional but recommended. You’ll be able to interact with Google experts and ask questions. Register now to learn all this and more at the first Chrome Live event on Wednesday, April 22nd at 10:00am PDT. 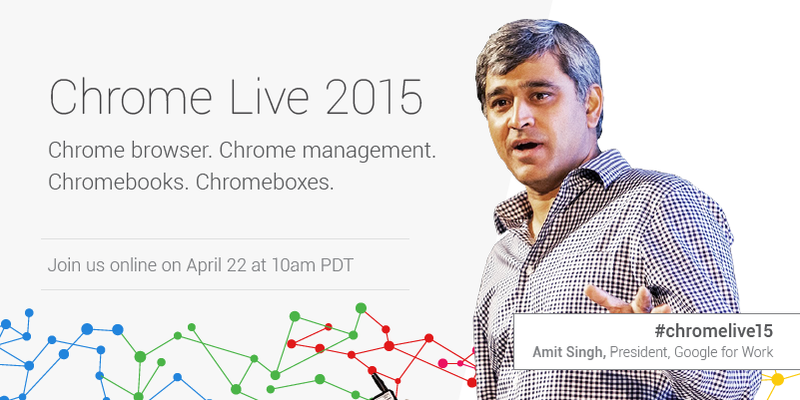 And even if you can’t attend on the scheduled dates, be sure to register to stay up to date on all things Chrome. Feel free to share your thoughts, impressions and questions using #chromelive15 on social media.